Trying to get all my plumbing taken care of before I start the wiring. I ran into a problem hooking up the heater hose to the water pump fitting. The problem is that it comes directly into the alternator, about 3 inches away. the hose will not make that tight a bend without kinking. Is there some way to make this bend that I'm not aware of? Last heater hose connection to make, and I'm snookered. Damn, that stuff's not cheap! I wish I had spotted this sooner, and not after I purchased bulk. With the mistakes I keep making, this could be the most expensive, and longest build ever! Thanks for the info Mark. Should be able to find a plastic 90 degree elbow. Just make sure it is not cheap stuff. Just last week I discovered a plastic hose connector was leaking and realized all that heater plumbing was 15 years old. The Gates 28479 has the built in elbow, clears my Alternator and enough length (40") to reach the heater hose. You can shorten the elbow to keep it tucked into the intake valley and away from the alternator. Just needed the 5/8-3/4 connector to finish that effort. I picked up everything at Oreiliy but others will have it. PHILLIP, SemperFi, They call the wind MARIAH. "Against all enemies, foreign and domestic"
Marines lend an air of dignity to what would otherwise be a vulgar brawl. FFR#3175, Wimbledon/Guardsman, 302 Carb, CobraEarl's Footbox & Touring Trunk, Snapless Tonneau Cover, Luggage Rack, Whitby Hardtop. When I had a heater, I used a trimmed down heater by-pass hose for the elbow. An adapter plus a length of bulk hose completed the line. Thanks for all the ideas guys. I'll check these out and see which will work best for me. Went to the auto parts today to see what was available. Ran across a counter guy who was really interested in helping. 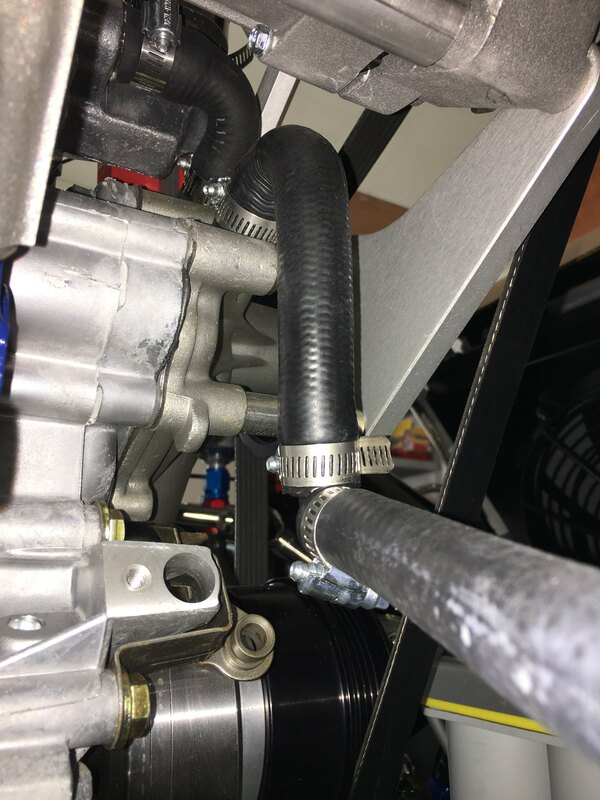 Not only did he find a 36" heater hose with a molded 90 degree bend at one end, he checked his computer, and could not find it in inventory. Long story short, he sold it to me for the price of 36" of regular heater hose. Less than $5 for a $30 part! Once in a while it's nice to get lucky. Should be able to finish this tomorrow and cross it off the list.